A Bomb disposal unit was called to the park after a suspect package was found near one of the rides. Staff members evacuated 1,800 guests from the area, after a black bag was discovered nearby just after 1pm on Friday. Visitors were kept away from the area for nearly three hours until a controlled explosion was carried out at 3.50pm and the area was made safe. The package turned out to be harmless. Liz Greenwood, media spokesman for the theme park, said: "We evacuated a sector of the park just after 1pm when a suspect package was spotted by a member of staff on a perimeter road adjacent to the area. "The area, which houses Oblivion, was evacuated and police were called in. The bomb disposal team came in and carried out a controlled explosion about 3.50pm and made the area safe. "The package turned out to be harmless but under the current circumstances we decided to err on the side of caution. "Only a small area was disrupted for just under three hours but the rest of the park continued to operate as normal. 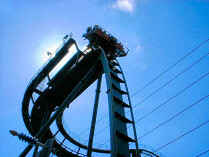 We also extended the ride close time until 6.30pm so visitors could enjoy the rides in the sector that had been closed." Sergeant Nigel Bowers, from Staffordshire Police, said: "A controlled explosion was carried out and the area made safe. Investigators found the package was harmless." The Towers are open to visitors - have a spooky look around.